Our traditionally cured Pancetta is made of pork belly. It is made with a blend of pepper and juniper which will leave a fantastic taste in your mouth. 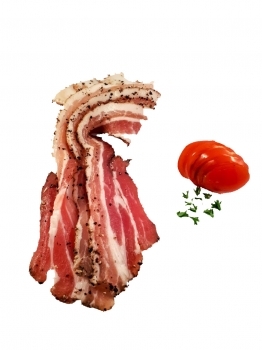 There are so many ways to use these rashers - Great tossed in a salad or served with a traditional Irish breakfast. Delicious wrapped around your joint of meat while roasting. You can click on the 'Recipe and Serving Ideas' for a full list of bacon recipes.